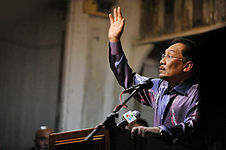 Mr. Anwar Ibrahim, a Malaysian politician and Leader of the Opposition, has held a number of roles in the Malaysian government over time. Although he is the current Leader of Opposition, the economic advisor for the state government of Selangor, a Malaysian state, and the de-facto leader of the People’s Justice Party, his political career first found its roots when he began his education at the University of Malaya in Kuala Lumpur. While studying in University, Ibrahim became widely-known as an Islamist student activist and leader, and in 1971, he founded the Muslim Youth Movement of Malaysia. In 1982, Ibrahim was offered membership to the United Malays National Organization (UNMO) by then Prime Minister, Mahathir Bin Mohamad. Ibrahim rose the ranks quickly, first serving as the Minister of Culture, Youth and Sports in 1983, the Minister of Agriculture in 1984, the Minister of Education in 1986, a role which he kept until 1991. From 1991 until 1998, Ibrahim served as the Finance Minister, and was the Deputy Prime Minister from 1993 until 1998. However, his involvement as a prominent politician in the Malaysian government came to an abrupt halt when he was removed from his posts by Prime Minister Mahathir Mohamad, and was put into jail for the crimes of corruption in 1999, amidst disputes between Mahathir and Ibrahim over economic measures that were to be implemented within the country. Prime Minister Mohamad’s successor, Abdullah Ahmad Badawi, released Ibrahim, and he has since become the leading opposition figure. Forgiveness is a vital part of Ibrahim’s life, and it has consistently played a prominent role in his dealing with others who have mistreated him. An example he gave was of an issue that arose in 2008 when the Foreign Minister of the time called Ibrahim an American agent. Such an accusation is taken extremely seriously, and Ibrahim was thus compelled to take the case to court, but six years later, when both men appeared in court, the Foreign Minister who had accused him of being an American spy said that it had been long since this issue had occurred, and urged that it was time to drop the case and move on. Ibrahim agreed, but placed the condition that if he dropped the case, then the Foreign Minister had to retract his statements and publicly apologize. The Foreign Minister refused, saying that he wouldn’t do so in public but would do so privately in the chambers so that it would appear in court documents. Much to the shock of his family and friends, Ibrahim agreed, dropped the case and accepted his apology. His family and friends, he said, were furious and confused, but, “… then they understood. They said that the Quran is very clear, and that it’s superior to forgive.” Thus, both religion and forgiveness have played a vital role in Ibrahim’s decision making.